Who would you take with you on a trip to Jamaica? I would love for my best friend and I to go if I was to win! Upload a photo of Who is Jamaican You Happy, tell why, share it with friends who are 21+, and you could win a trip for two to the Hilton Rose Hall Resort & Spa in Jamaica! 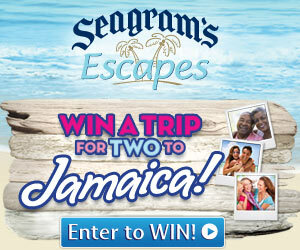 Additionally, each week the two highest ranking new entries will receive a bundle of Seagram’s Escapes beach accessories, just in time for summer! Participants must be 21 years or older to enter and be 21+ in the photo. Good luck everyone! Enter here! **To Enter you must upload an image through the Facebook Contest page in addition to writing a small piece on why that person makes you happy!